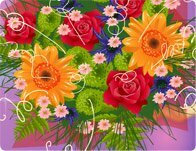 Description: Friends, fun, and flowers! Summer is almost here and that means its time to plant some seeds and watch 'em grow! Pick up a tray of fun from the Florist and make this summer a colorful and natural expression of good times. Instructions: Use your mouse to click on and drag the icons at the bottom of the screen to the stage and design a summer get together with flowers, friends and fun!